Standing desks are an ideal way to combat the health implications of sitting all day, but many people are turned off by the cost of buying one. That’s where The Upstanding Desk comes in, an affordable add-on that converts any regular desk into a workstation you can use while standing. 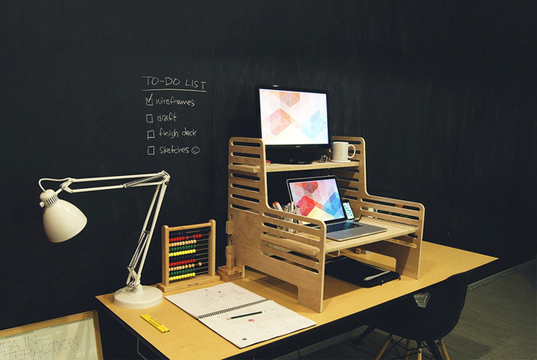 Designed by Brooklyn-based designers Mikey Chen and Sam Carmichael, the desk costs less than $200, and there is even the option of buying the plans and making it yourself – assuming you have the necessary DIY skills. Made from five pieces of premium Canadian plywood, the flat-pack desk can be assembled in under a minute, and doesn’t require any unsightly add-ons such as fasteners. Each desk has two levels, one for a monitor, and another for components such as your laptop, keyboard, or mouse. These levels can also be adjusted in 1″ increments, which makes it easy to customize the height of the desk to your own body and preferred work setup. For those who really love their gadgets, there is even a perfectly-sized groove that can accommodate smartphones and tablets. Carmichael, one of the designers, had his first experience with a standing desk while working a full-time job, during which time he managed to convince the company to buy him a $1800 standing desk. Eventually, the motorized desk broke, leaving him with a very expensive, and very normal desk. After that, he attended New York’s School of Visual Arts, where his plan to buy a standing desk was foiled by the permanent work benches. That’s when he decided to design something of his own, and The Upstanding Desk was born. If you’re interested in improving your health, and making sure the office doesn’t get the best of you, the desks are available for preorder right here. Standing desks are an ideal way to combat the health implications of sitting all day, but many people are turned off by the cost of buying one. That's where The Upstanding Desk comes in, an affordable add-on that converts any regular desk into a workstation you can use while standing. 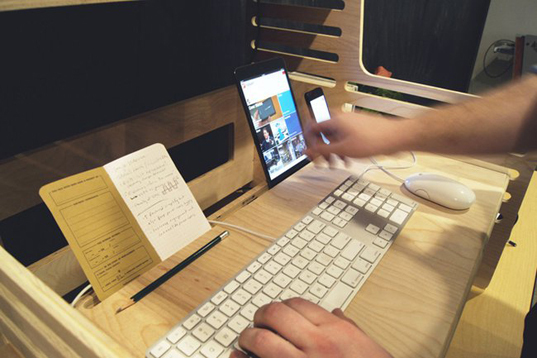 Designed by Brooklyn-based designers Mikey Chen and Sam Carmichael, the desk costs less than $200, and there is even the option of buying the plans and making it yourself – assuming you have the necessary DIY skills.